The Learning Route methodology, developed by Procasur, emphasises learning from the field and provides novel ways for knowledge development and exchange amongst different stakeholders. Par ticipants on the Learning Route, ruteros, are taken to visit local initiatives that embody best practices. Local actors become trainers of the Route, sharing their knowledge and innovations with the ruteros during field visits. The par ticipants come from different professional and geographic backgrounds, and collectively analyse the cases that they visit.While travelling the route, they work with facilitators and other par ticipants to identify the specific lessons that are relevant to their individual contexts. The learning during the Route goes two ways: local champions share their knowledge and the ruteros provide specific recommendations. Throughout the whole journey, time is dedicated to the elaboration of Innovation Plans, an impor tant tool of the Learning Routes aimed at introducing innovations and changes in par ticipants’ institutions and organisations. This approach allows innovations to travel from one place to the next. “These Learning Routes are an innovation in the region”, says Hammou Laamrani, coordinator of the IDRC-IFAD knowledge network KariaNet. 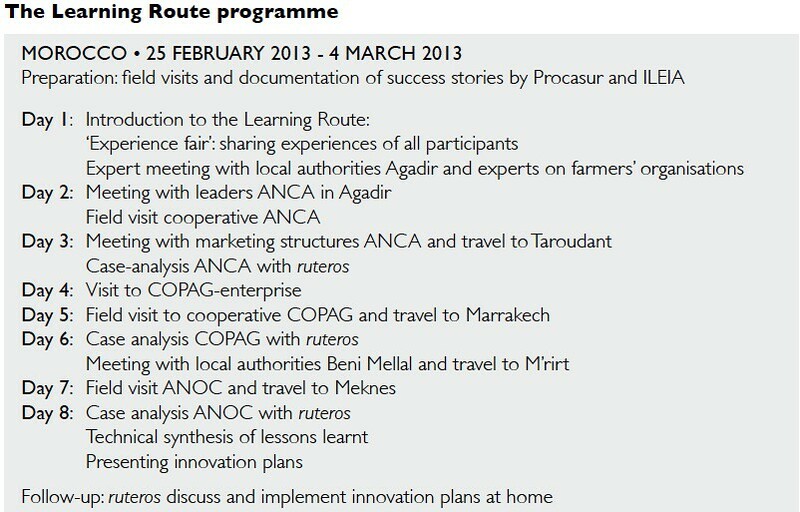 Part of the Procasur-KariaNet Learning Route Programme, they are the first of their kind to be held in the MENA region. 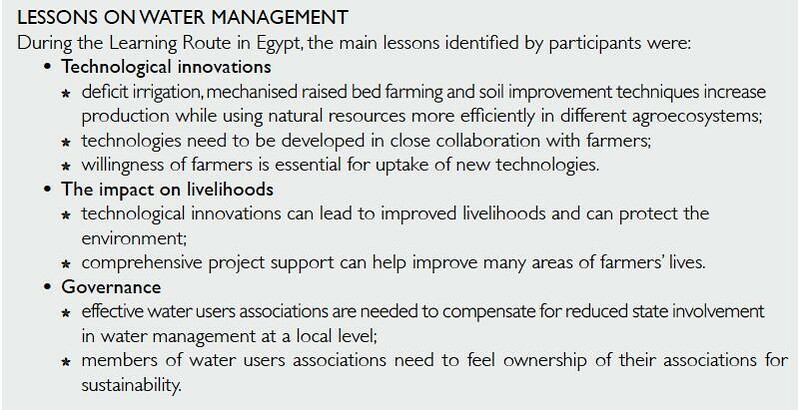 In 2012 KariaNet and Procasur conducted a needs assessment in Beirut involving KariaNet members, which identified two specific themes - farmers’ organisations and water management - that required more knowledge development in MENA countries. After screening several success cases within these two themes in different countries, Morocco (farmers’ organisations) and Egypt (water management) were chosen as the host countries for the Learning Routes. Six exemplary cases (three per route) were selected. As preparation for the Learning Route, Procasur and ILEIA, supported by local KariaNet teams, documented the most successful innovations, creating a document that provided preliminary study material for the participants (see References at the end of this booklet).This preparatory visit to the hosts also helped to prepare and reinforce the learning process with local talents. The two Learning Routes were designed to benefit development practitioners and decision makers within the MENA Region.Thirty-six participants in total were selected (20 in Morocco and 16 in Egypt). The diverse group of participants included representatives from ministries of agriculture, research institutes, international organisations, NGOs and development funds in Algeria, Egypt, Jordan, Lebanon, Morocco, Palestine, Sudan, Syria, Tunisia and Yemen. 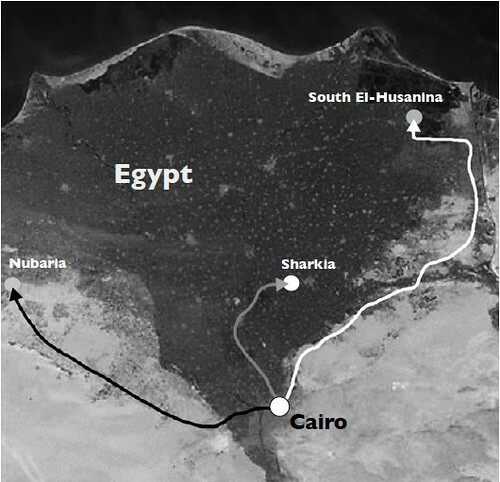 Over the seven or eight days of each route, the participants visited three experiences. Participants were selected on the grounds of their potential to act as agents of change within their organisations. Armed with the lessons learnt along the Learning Routes, they returned home and are now working to integrate these innovations into their own work. Farmers’ organisations generally have the objectives of uniting farmers, defending their interests when dealing with state agencies and other organisations and providing specific services to improve the lives of their members. Most farmers’ organisations have a cooperative legal status and promote values of equality, solidarity, democracy, mutual help and individual responsibility. In the MENA region, there are more or less 30,000 cooperatives, 60% of which are related to agriculture. There are some striking commonalities between most organisations: they are often state-controlled and their efficiency and functionality is limited - either because political decentralisation is not complete and/or they lack sufficient internal resources and capacities. 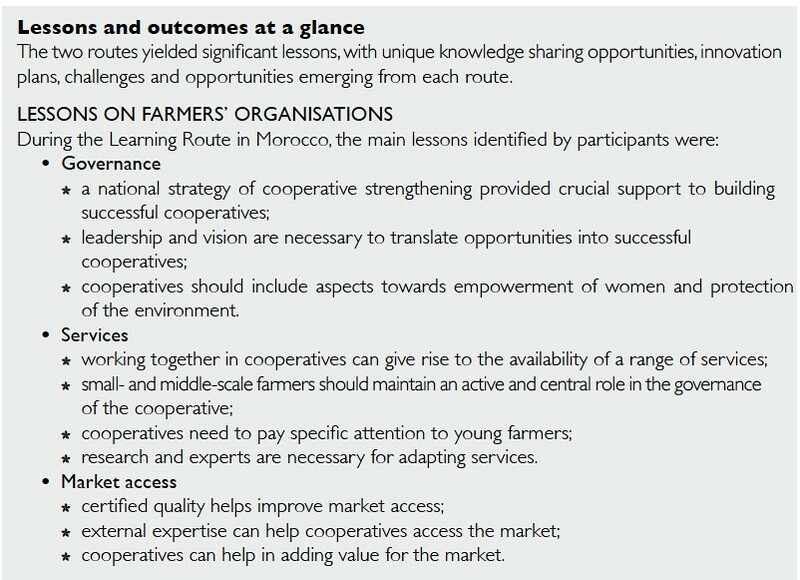 However, farmers’ organisations can have a great impact when they manage to unite stakeholders and obtain access to markets, financial prospects, good governance and leadership (Aitlhaj, A., 2013). Morocco has some successful experiences in this respect. Good water management means getting the most from the available water in a sustainable way. In the MENA region, water is scarce and not adequately protected. In Egypt, the main water source is the river Nile, where water is released into different levels of open canals down to smaller irrigation canals known as mesqas. There are high levels of water degradation. There is a need to reduce water use, through technologies that will increase the efficiency of water use and storage, and through policies for implementation. Often, there is a focus on managing the water supply by maintaining irrigation networks (canals and drains) or by harvesting rain water. However, increasing attention is being given to managing demand for water.The region needs to improve water use efficiency by introducing innovative and cost-effective technologies, for instance in using waste water. To move to demand management with a downstream control system, it is impor tant to know the farmers’ complete water requirements at each stage of cultivation. This knowledge will help water managers to satisfy farmers’ needs with limited water resources. ICARDA’s Water Benchmark Project has developed technological packages for water management and crop cultivation that are adapted to different agroecological contexts, including old lands, new lands and salt-affected lands.The lessons from this project were the focus of the second Learning Route.